One of the most powerful crafts currently in production. The engine was specially designed just for use in this craft, and is assembled by hand at the Gryphon facility in East Hyokia? along with the craft itself. Its design is a bit taller than usual for a craft capable of such speed, but air ducts in the front increase the aerodynamics, making it cause less drag as it speeds along at its top speeds. The interior is top-of-the-line, heated, air conditioned, massaging leather seating for driver and passenger, as well as 12-way power-adjustments. Computer systems onboard include GPS navigation, fully-computerized climate and sound system controls that respond to voice recognition as well as by a self-cleaning touchscreen and buttons, as well as performance and systems monitoring that alerts you of any problems the moment they appear. Along with that is a smart engine protection system that automatically changes how the engine is working in order to prevent damage to other components if one part breaks, or to eliminate more damage if one part is repairable. 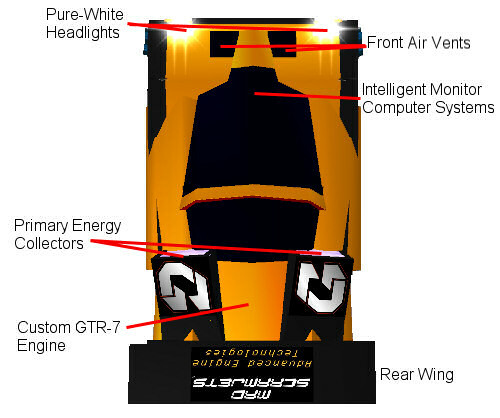 This model is Gryphon's racing base, so therefore it is always updated with the latest advancements in racing technology. As pictured below, side-splitters and a larger rear wing add increased downforce and stability in cornering. In a first for hovercrafts, the front energy collector is a generated collection field as opposed to a solid plate. This allows air to pass through the collector and through the Venturi ducts below the craft, exiting out the rear collector beneath the thrust nozzles.